Always trying to figure out which bin is yours after they have been emptied? 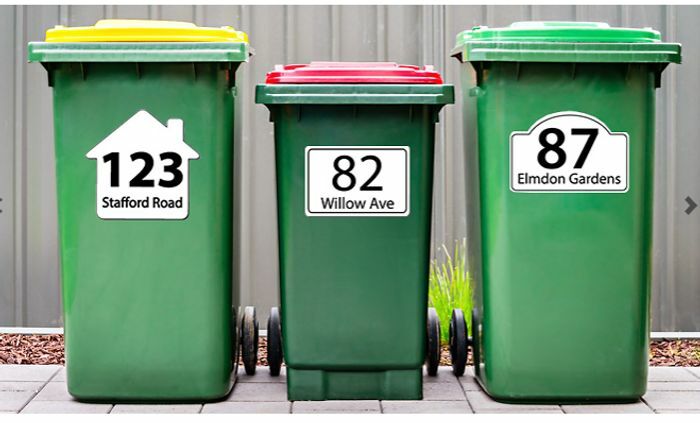 Now you won't have to because these personalised bin stickers are on a great bargain price at £2.99. There's 6 in a pack so enough to do your household waste, recycling and garden waste bins. You can choose from 4 x different designs including: oval, rectangular, house and arch style and personalise them with your house number and street name. that seems like a good price thanks for sharing. Off to order. I have these and they are amazing. Great quality and easy to find my bins once they have been emptied. I got these, they’re pretty good quality, the only thing I will say, is that the bins they have stuck them on for the photos must be really small because the stickers aren’t anything like as big as we were expecting them to be. They’re no bigger than 15cm x 10cm. These would be so handy so it's clear which one is ours. Thanks so much for sharing. This will make things much easier for Us as have to mark ours next to the neifhbours. Already adorned our bin with Floral Nature Stickers so we know it's our's ..